The Blackhawks lose at home for the first time this season. First time Hawks fans watch their team lose at UC. The gray, wet miserable Sunday was a perfect backdrop for the Chicago-area sports teams in action. 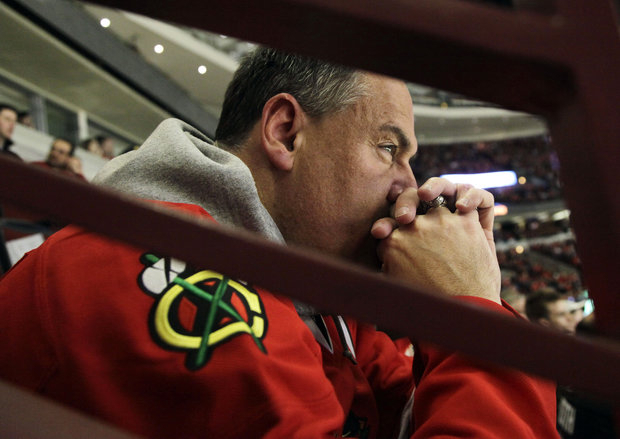 Losses for the Blackhawks, Bulls, Northwestern and Illinois ended the weekend. What looked like a huge blow out in the making for Edmonton was almost a dramatic comeback for the Blackhawks. The Hawks came close, but lost 6-5 suffering their first regulation defeat at the United Center this season. The Oilers pelted Blackhawks starting goalie Ray Emery, scoring three times in the first ten minutes of the first period. After the third score from the Oilers&apos; Ryan Whitney, Coach Joel Quenneville pulled Emery and put in Corey Crawford. Edmonton scored on Crawford with a power play goal just two minutes later. Down 4-0 the “Madhouse on Madison Street” was silent for a period for the first time this year and came alive in the second. Goals by Patrick Kane, Sheldon Brookbank (his first of the season), Marian Hossa and Brent Seabrook got a maudlin crowd back into the game. The Oilers had to go with their backup goalie when starter Devan Dubnyk was lambasted by his own teammate, as Hossa crashed the net. Edmonton did score one more time in the second and led 6-4 going into the final period. Kane notch his second goal during the 3rd and cut the deficit to 6-5, but the Hawks were unable to complete the rally and now have back to back losses. In his post-game comments, Quenneville pointed out that Kane “had a heck of a game.” The team promotional give away were St. Patrick Day hats. If Kane could have pulled off the hat trick it would have been fun to watch them littered on the ice. Most people agree that it would have been impossible for this team to remain at the high octane level the Blackhawks were playing this season. It isn’t surprising the Hawks look a little tired and a bit slower the past two games, they have played seven games in eleven days. After the game, the players said the schedule was not an excuse, however, they all agreed they are looking forward to their longest rest (three days off) until they hit the road. Coach Q will not have a practice until Wednesday and then they travel to Columbus to begin a four game road trip on Thursday. On the West Coast, the very banged up and battered Bulls team started their week in California with a loss to the LA Lakers. They held Kobe Bryant in check with 19 points, but could not contain the Lakers big man Dwight Howard, who tore down 21 boards and scored 16 points in the 90-81 win over the Bulls. Missing another game were Kirk Hindrich, Richard Hamilton, Taj Gibson and of course Derrick Rose. What is a Bulls game without another report about the injured guard? During the game, the network broadcast had a report that Rose feels like his hamstrings are "on fire" after work-outs. Who knows what the reality of that situation is, but the lack of personnel is being felt. Nate Robinson led the Bulls with 19 points and Joakim Noah had a terrific day with 18 points and 17 rebounds. Coach Thibodeau only used seven players all game and one (Marquis Teague) played just 4 minutes.The injury-depleted Bulls travel to Golden State and Sacramento later this week. Illinois and Northwestern finished their regular season schedule with losses. The Illini were beaten at Ohio State 68-55 and the Wildcats dropped their season finale to Michigan State 71-61. Next up is the Big Ten Conference Tournament at the United Center this Thursday. Eight seed Illinois will play #9 Minnesota at 11 a.m. Later that evening, #11 Northwestern will play #6 Iowa. Could this be the final game for Wildcat coach Bill Carmody? Probably. The tournament has sold out the four day weekend (a first prior to the event). That pretty much underscores the fact that this is considered the premier conference in the nation. The United Center should be rocking!